Relaxation is a state of mind. Different people find it in very different places. Some try yoga — relentlessly perfecting pretzel-like movements that the most elusive contortionist or escape artist might scowl at. Some try a day at the spa, filled with mud baths, cucumber sunglasses and uncomfortably long exposure to overly confident and under-clothed sauna goers sporting only a towel, or less. 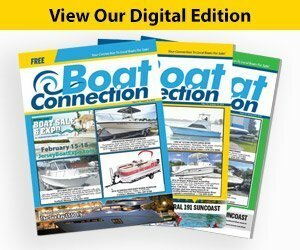 But, there is one hobby that has consistently been the source of endless days and nights of relaxing moments, filled with warm and oftentimes memorable moments between fathers and sons, and even mothers and daughters on occasion — the timeless task of boarding a boat and going out to fish the day away. 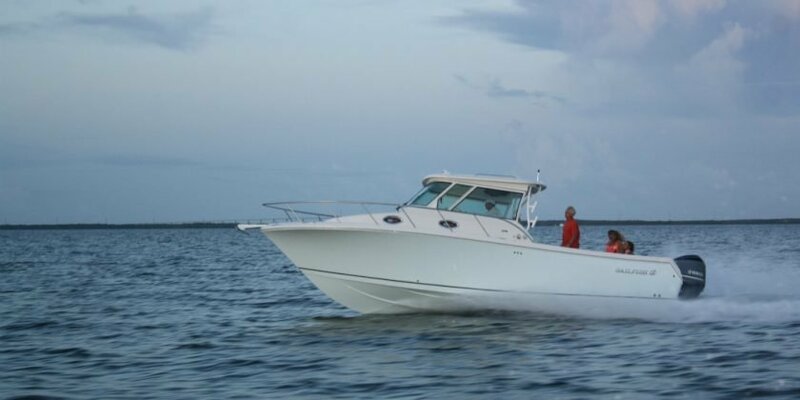 Now, in order to be able to get to the point where you are truly in a relaxed state of mind and enjoying your life in the moment, you need the right kind of boat to facilitate those yet-to-be-made-memories, and the Sailfish 320 Express Walk Around may just be the perfect boat. 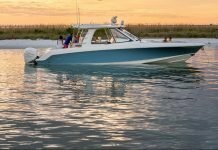 Built on the same hull as the venerable Sailfish CC, the 320 Express Walk Around has all the all the panache and pizzazz of the CC, but goes about its existence with a slightly softer approach. 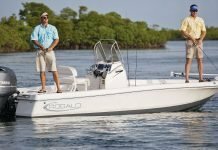 The 320 Walk Around has its fundamentals deeply rooted in the world of fishing, but chooses to focus a bit more on comfort, which is something that both fishermen and non-fishermen can appreciate. 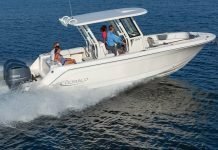 As previously mentioned, Sailfish 320 employs the same Variable Deadrise Stepped (VDS) hull design as its well-established sibling. All three panels on the bottom of the boat “warp” as they move and vary from 58 degrees at the bottom to 48 degrees outboard that allows the 320 to slice through the waves without causing any undue nausea and then they “warp” yet again in the keel section at a low 24 degrees to an even lower 22 degrees outboard to aid with stability. 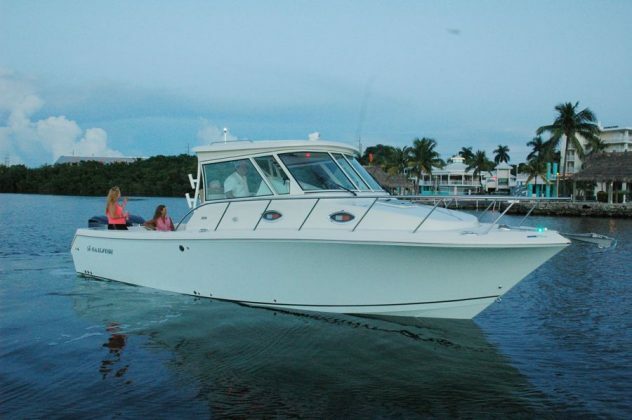 The Sailfish 320 does hold true to its fishing roots. Stepping on from the transom, you will quickly notice the 30-gallon live well, as well as the tackle storage space and prep station just aft of the helm seat (there is more storage behind the port seat as well). 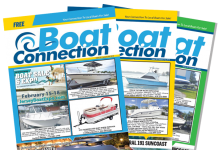 You might also notice that there are eight rod holders atop the transom and another six around the boat in various, and useful, places. 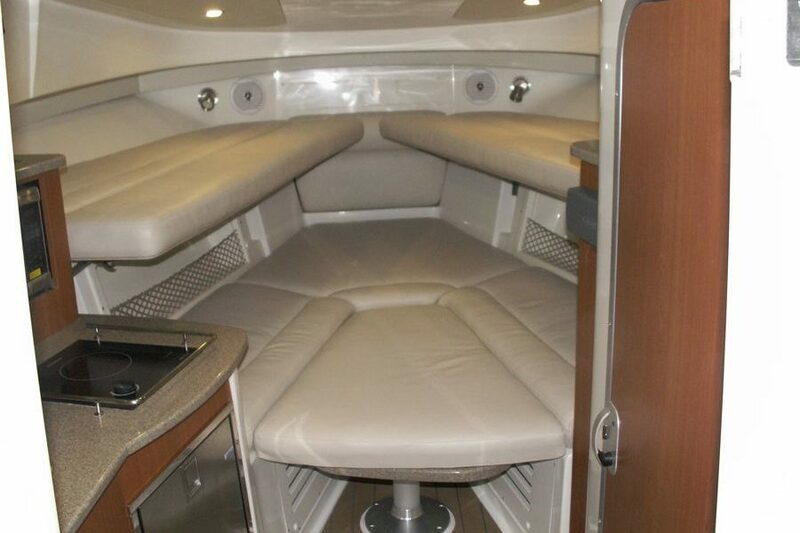 There are also two fishboxes located in the deck, and an optional underseat cooler also in the transom. What you won’t notice is the carbon fiber that the deck is reinforced with, which means that the addition of a fighting chair would not be out of place if you really wanted to go for the big game. 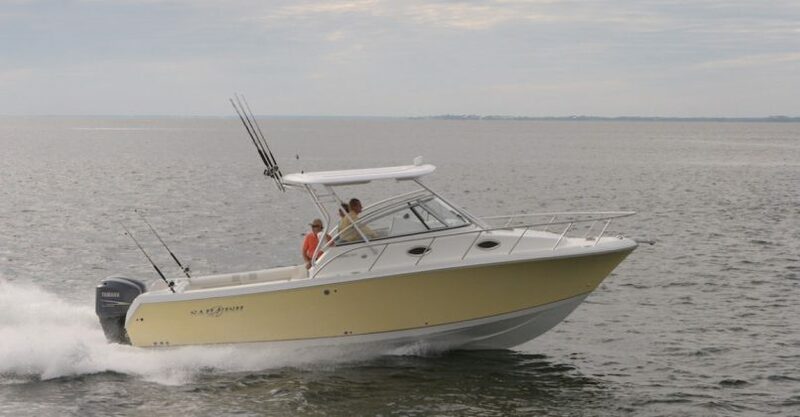 But, as also mentioned, while the 320 Walk Around is a true fishing boat, it does its best to also make sure that family and friends that are just out for a day of fun in the sun have nothing to complain about either. The wide captain’s chair is plush and comfy, as is the passenger lounge seat. The full framed windshield keeps the elements away as needed and the openable side windows allow airflow to keep even the hottest days cooler. 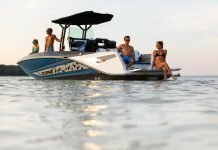 There is also optional seating over the transom as well as folding bench seat or cooler seat, and everyone will have a place to sit. 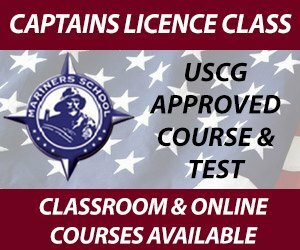 If you want to pony up a little extra for options, there is also an overnight package that allows for well, overnights, by way of a gas generator and even cabin air conditioning to allow for 24 hour comfort. The cabin itself has all the essentials to compliment the overnight ideology — a stove, refrigerator and very necessary microwave sit next to a sink and faucet, while a triangular table is surrounded by a V-shaped booth for seating. 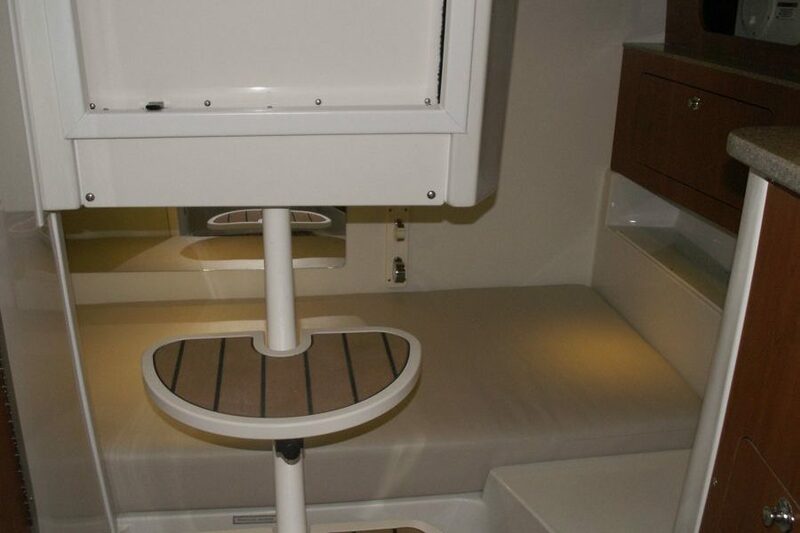 There is room for four full-sized adults to sleep on board, while the enclosed wet head setup helps keep everyone from smelling like their catches. The sink utilizes a pull out sprayer that is also a useableshower head. 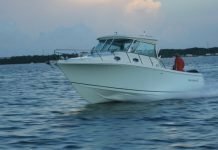 For a 32’ boat with a 10’ beam and a dry weight of 11,850 pounds, the Sailfish 320 Express Walk Around is no guppy sized boat, but even with the understanding that it isn’t small, it still manages to feel bigger than it is thanks to its exceptionally ergonomic design. It allows you to focus on the task at hand, and for our money, when that task is reeling in a 50 pound Albacore tuna, we’re all for it. And once that task is done with, we can all but promise that that feeling of relaxation will beat any Downward Facing Dog pose or liver-spotted spa sighting every single time.